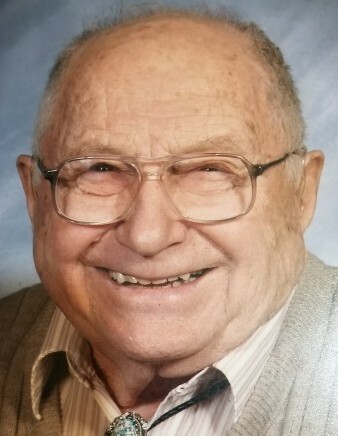 Raymond “Ray” Hernke, 95, died Saturday August 25, 2018. He was born December 19, 1922 in Hilbert, WI. son of the late John Hernke and Lillian (Franzke) Bratz. Ray married Alice Lau on December 15, 1954. She preceded him in death on June 24, 2009. Ray worked on the family farm until 1954, when he went to work at the Kimberly Paper Mill retiring in 1988. He enjoyed spending time at his cottage fishing, wood working and playing Sheepshead. Ray’s greatest enjoyment came from his time spent with his family, especially his grandchildren and great grandchildren. Ray is survived by his special friend Bev School; six children; two sons: Don Ott and Jerold (Dawn) Hernke; and four daughters: Joan (Troy) Tollard, Cheryl Fisher, Wendy (John) Lind and Dona (Ron) Dollevoet; 11 grandchildren; 14 great grandchildren; and one great-great grandson. Funeral service for Ray will be 4:00 PM on Thursday August 30, 2018 at IMMANUEL UNITED CHURCH OF CHRIST, 510 Sullivan Ave, Kaukauna, with Rev. Lynn Martin officiating. Visitation will be held at the church on Thursday afternoon beginning at 2:00 until 3:45 PM, with service to start at 4:00 PM. Entombment will be in Star of Hope Mausoleum at Highland Memorial Park. In lieu of flowers, a memorial has been established. Ray’s family would like to extend a special thank you to the entire staff of both, Grand Horizons and ThedaCare Regional Medical Center, Appleton for all of their care and compassion.